When spouses get separated pending divorce, the marital property that they own continues to be their joint property until a court divides it as part of the divorce. Some spouses take control of the marital property and use it for their own needs and wants. While the spouses can reasonably be expected to spend some of the marital assets to buy food and pay for other necessities, spouses should not use the marital assets to pay for things like vacations, purchases of cars, or houses. Spouses who are getting along or are in a low-conflict divorce may be able to agree that the marital assets will not be dissipated in any way while the divorce is pending. However, in many cases, for a spouse who wants to ensure that the marital assets will not be wasted away, it may be best to seek an injunction stopping the other spouse from wasting away the marital assets. An injunction is typically granted in cases where a spouse can show that the other spouse is about to transfer property out of Florida, fraudulently transfer it to another person or entity, or fraudulently hide marital property. This injunction can be used to protect from waste or concealment of property that will eventually be divided as marital property, and can also be used to protect property that may be required to pay child support and alimony. An injunction stopping a spouse from dissipating funds can be issued ex parte. This means that a court can issue the order with just the spouse filing the motion present in court. However, a court may require the petitioning spouse to post a bond if the injunction is granted in order to protect the rights of the other spouse. If there is no injunction in place and a spouse dissipates marital assets, all is not necessarily lost. If there are other marital assets, the court may award this to the non-dissipating spouse in order to make up for the property the other spouse dissipated. The court can also look to property in which the dissipating spouse has an interest in order to determine if it was bought with the dissipated marital funds. Additionally, if you are going through a divorce and will need support while the divorce is pending, you can file a motion seeking temporary child support and alimony. This may be especially helpful to a spouse who was a stay at home parent or a homemaker during the marriage. An award of temporary support can help the spouse get by before the divorce is finalized and a permanent award is granted if the court determines it is warranted. 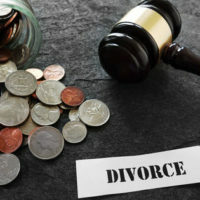 If you are going through a divorce and are worried about making ends meet while the divorce is pending, or that your spouse will spend all your marital assets before the court equitably divides them, you need an experienced divorce attorney fighting for you. Contact our compassionate and experienced Boca Raton, Florida divorce attorneys at the Law Offices of Schwartz l White to schedule a consultation today.